Nationality: American. Born: Goldie Jeanne Hawn in Washington, D.C., 21 November 1945. Education: Attended Montgomery Blair High School, Silver Spring, Maryland; American University, Washington, D.C. Family: Married 1) the director Gus Trikonis, 1969 (divorced 1976); 2) the musician-comedian Bill Hudson in 1976 (divorced 1980), son: Oliver, daughter: Kate Garry; also son Wyatt with longtime partner the actor Kurt Russell. Career: 1965—toured as dancer in Kiss Me Kate ; danced at The Desert Inn, Las Vegas; 1967—TV debut as dancer on Andy Griffith special; 1967–68—regular on TV show Good Morning World ; 1968–70—regular on Rowan and Martin's Laugh-In ; 1968—film debut in The One and Only, Genuine, Original Family Band ; 1980—co-founder of Hawn-Mayers-Shyer-Miller Productions, subsequently active as producer. Awards: Best Supporting Actress, Academy Award for Cactus Flower , 1969. Films and Filming (London), August 1978. Photoplay (London), December 1981 and August 1982. Berman, Connie, Solid Goldie: An Illustrated Biography of Goldie Hawn , New York, 1981. Haining, Peter, Goldie , London, 1985. Shapiro, Marc, Pure Goldie: The Life and Career of Goldie Hawn , Carol Publishing Group, 1998. Current Biography 1971 , New York, 1971. Thomson, David, "Goldie Gets Serious," in Film Comment (New York), November/December 1982. "Jonathan Demme: On the Line," in American Film (Washington, D.C.), January-February 1984. McGillivray, D., "Goldie Hawn," in Films and Filming (London), July 1985. Hadleigh, B., "Goldie Looks to the Future," in Film Monthly , October 1990. Radio Times (London), 16 March 1991. Hirschberg, Lynn, "Solid Goldie," Vanity Fair (New York), March 1992. Iskusstvo Kino (Moscow), July 1993. It is the rare film fan who does not know that Goldie Hawn began her career playing the dumb, forgetful blond on television's Laugh-In . But few, save industry insiders, realize that during the 1980s Goldie Hawn had become one of the most powerful producers in Hollywood, occupying a rung of power below only the likes of a Steven Spielberg or a George Lucas. Private Benjamin proved her mettle; Swing Shift and Protocol , while fascinating films, failed at the box office. The remarkable fact is that Hawn, with her image as the "dizzy blond," was able to acquire so much clout in the first place. In the 1960s few women were able to make their way from television fame to stardom on the silver screen. 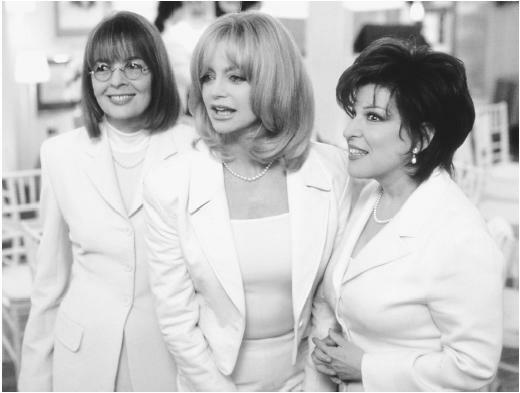 Goldie Hawn's Emmy-winning work on the hit Laugh-In changed that, launching her movie career, as well as introducing the world to the considerable talents of Lily Tomlin. Goldie Hawn made her first major motion picture count. She won an Oscar, as best supporting actress, for Cactus Flower in 1969. By the early 1970s she was considered a rising young star. Her performance in Steven Spielberg's The Sugarland Express brought her notice among the rising young talents behind the camera; her fame spread because of the millions paid to see Hal Ashby's Shampoo . But Goldie Hawn aspired to gain control of her projects. After a disappointment producing The Girl from Petrovka , her break came with Private Benjamin for which she served as executive producer and star. Private Benjamin is the tale of a bubbleheaded, spoiled Jewish American Princess who enlists in the army and changes into a strong, mature woman. This was tailor-made for Hawn by Hawn, made a lot of money, and was eventually turned into an short-lived television series in which she did not star. But being a producer was fraught with peril. Wildcats , directed by Michael Ritchie, has Hawn as a divorced mother of two who asks to become the football coach and with grit takes on the job for an inner-city Chicago high school. Eventually she earns the team's respect and in the end coaches the team to a win in the big game (over the high school she worked at) and "proves" that women can coach football as well as men. Hawn the producer seems to be satisfied with obvious comic situations; it was hard to locate fresh "Goldie Hawn" vehicles. Yet there were major exceptions. Her best work proved very, very good. For example, as the creative force behind Swing Shift , released in 1984 through Warner Brothers, producer Hawn and director Jonathan Demme crafted a complex tale of the female workers in a defense plant during World War II. The reaction of a Los Angeles, emerging into a mature city, and the sexual tension of the war—women doing traditionally men's roles—was contrast with the difficulties of maintaining relationships near and far away. This is a rare Hollywood film told from a woman's point of view. But therein comes the contradiction. Swing Shift was not what the public thought of a typical "Goldie Hawn" film and the movie quietly disappeared into the world of home video. The contradiction can be fully appreciated by contrasting Swing Shift with a more typical Hawn-produced farce, Protocol . With a more conventional director, Herbert Ross, and a promising screenplay by Buck Henry, we have a scatterbrained "Goldie" (here named Sunny) who gets caught up in the world of politics in our nation's capitol. Critics called it, appropriately, "Goldie Goes to Washington." The pace was rapid fire, the jokes sometimes offensive (in particular to Arabs), but the laughs were genuine. In the end the critics found the film contrived. The film also made not as much money as expected and so the star of Goldie Hawn, the perpetual scatterbrained, blond smarter than she seemed at first glance, was giving way to a 45-year-old woman with few available roles. The 1990s have not been good to Hawn, with little success associated with Deceived , Crisscross , or Housesitter . Her work as co-executive producer of My Blue Heaven also did not change the downward direction of her acting career. The 1990s were better on television with An Evening with Bette, Cher, Goldie, Meryl, Olivia, Lily and Robin , for ABC, and regular appearances on the annual Academy Awards shows. One wishes her luck as she begins to transform her career as a motion picture director.